d a n i e l l e b u r k l e o : are you in? are you sick of headbands this week yet? no? oh, good. me either. i had another post set to go for today but since ya'll (i'm not southern, but i like to say this) loved on the headband swap yesterday i figured i'd contemplate hosting a little headband swap extravaganza, right here on this little blog, like some of you suggested. then i thought to myself...contemplate? who contemplates anymore? i am doing it! booya. what do you think? are you in? if none of you are in, well, then, mom... mom, are you reading? buy me a headband and i'll do the same. for reals, this will be a fun time. us ladies need to treat ourselves sometimes. and you aren't even buying for yourself! you are just guaranteed something just as wonderful in return. it's like your birthday but better. much, much better. trust me. and the best part is you make a new friend outta it. this is fun. i'm giddy excited. i don't really ever stand with my hand on my hip like that. don't judge me. and my shirt isn't falling off my shoulder so you can see my bra strap either. happy weekend you lovelies, you. haha, you're adorable! These headbands all look way cuter on you than they would on my dull hair! my favorite thing about my head, pretty sure, is that it holds up my headbands;) haha, so cute girl! ohh how fun. 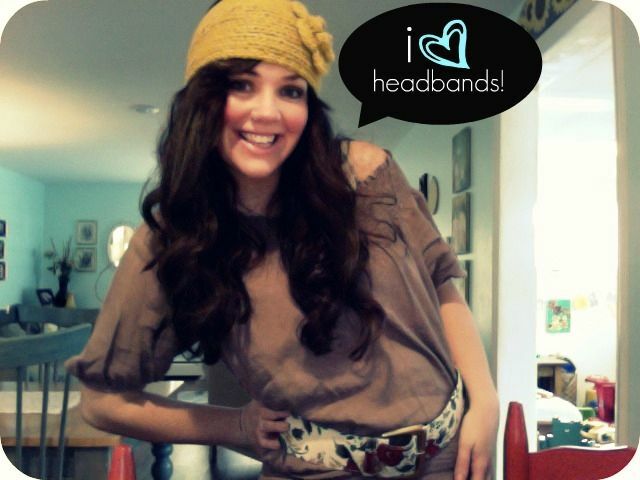 i LOVE headbands! count me in, i'll be emailing you soon!! You are too freakin' cute! This is a great idea. I'm totally in. E-mailing you right now! New follower too and sooooooo happy to be! 3. i may want in. 4. i ALWAYS stand with my hand on my hip. i never notice till someone points it out. HAHAHA! yay! I am excited for another SWAP!!! I just emailed you...I WANT IN. I'm new here, too. So, uh.. HI! dude i'm in. do i need to email you too? just count me in for some yarn flower goodness! totally not sick of headbands. :) I love that color too!